Does Your Videogame Comply With International Law? A new study published by two Swiss groups has found that players in videogames often have trouble complying with International Humanitarian, Human Rights and Criminal Law as it would be applied in real-world situations. Put together by Pro Juventute, a children's rights group, and TRIAL (Track Impunity Always), which promotes international criminal law, the study looked at 19 videogames, all shooters that take place in "armed conflict scenarios" of different types and even from different eras. The games were selected based on "extensive research on recent or popular" releases and gamers were hired and given a list of violations to look for and record while they played. A few of the games were played by the hired gamers while members of TRIAL and Pro Juventute watched, to ensure the games were being observed appropriately. The task was made more complex by the very nature of videogames, which the observers apparently had trouble with at times. "Analyzers sometimes had difficulties understanding the plot of the game and the context of the scenes. The games are very complex and the players are often given various possibilities to achieve their goals, thus making it difficult to determine which means and methods are available to the player and which rules apply," the report said. "In addition, because the games are controlled to a great extent by the player, a player of a particular game may see very different types of content than another, depending on the choices he or she makes. Thus, it is almost impossible to assure, despite engaging for many hours in game play, that all possible violations are found, or that in those games showing no violations, there exist indeed none." Violations discovered in the game range from the relatively mild and common "destruction of civilian property" to the "strong violation" that results from torturing the hell out of a guy in 24: The Game. Battlefield: Bad Company loses points for allowing players to take gold and treasures from destroyed civilian houses, which amounts to pillaging (strictly prohibited under IHL) while Frontlines: Fuels of War gets a beef for the inclusion of cluster bombs. 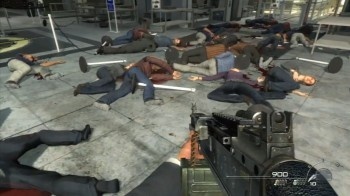 No violations were found in Close Combat: First to Fight, however, and games like Call of Duty 4: Modern Warfare and Rainbow 6 Vegas are noted for actually imposing restrictions on the player's actions that comply with international law. Videogames, the study concluded, aren't exactly conducive to compliance with international law and the authors would like to see that changed. "We believe and we have seen, in the course of playing different games, that punishing illegal conduct in video and computer games can be done and is, in fact, already done in some of the most popular games," they wrote. "However most of the time this is done partially, that is, limited to specific scenes or to only a few violations, allowing the commission of many others. The incorporation of rules of IHL and IHRL in a consistent manner in video and computer games is not only possible, but would surely render the games more interesting and would create players with a more accurate perspective of what is lawful and what is not in real armed conflict situations or law enforcement operations."